Dinner and a New Orleans Traditional Jazz Show! 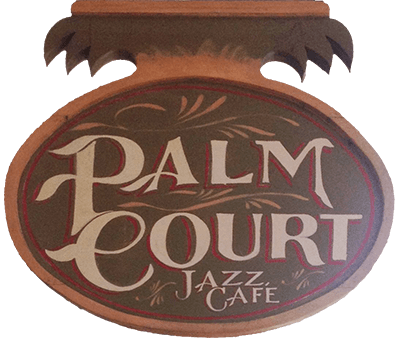 The Palm Court Jazz Cafe is located in one of the fastest growing areas of popularity in the French Quarter of New Orleans. Decatur Street is where it's happening these days and the Palm Court is one of the focal centers of interest. We provide an atmosphere and a service which is not available anywhere else in the city. "Where can we dine and listen to live traditional jazz?" is the question most often asked at the Concierge desk in the hotels, at the tourist information centers. We fulfill this need with quality food and quality music in an elegant but relaxed period atmosphere. Our cuisine has an impeccable New Orleans pedigree and includes recipes dating back for generations. This is fine creole cooking in its most subtle and authentic form. The Palm Court Jazz Cafe, housed in an old French Market warehouse, has become something of a traditional Jazz Center in New Orleans. Nina Buck opened The Palm Court in 1989 to provide an enjoyable and interesting jazz atmosphere with live music, dining, music information and a collection of jazz recordings which can be played on request. The Palm Court is a Great Venue for Weddings & Rehearsal Dinners. The decor and theme of the Jazz Cafe reflects the casual elegance of old New Orleans with classic mahogany bar, mosaic tiled floor and Steinway grand piano. 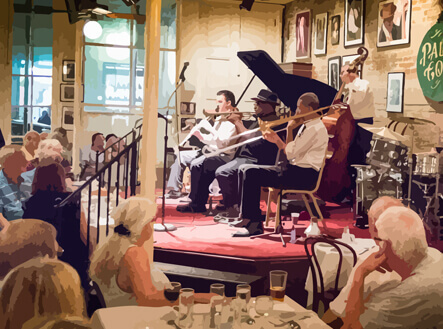 The Palm Court Cafe provides a comfortable relaxed atmosphere in which to meet, eat and enjoy good New Orleans music. We offer a wide variety of creole and continental dishes. CD's and Records from the GHB family of labels are available and an interesting collection of New Orleans music photographs are displayed on the old brick walls. 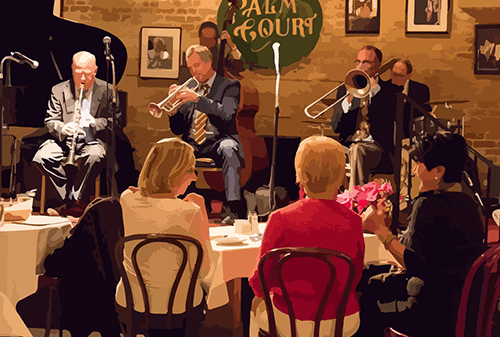 The Palm Court Jazz Cafe presents fine dining with live traditional jazz. Normal opening hours are Wednesday through Sunday, from 7pm to 11pm. The Palm Court is available seven nights a week for group bookings and private parties. Groups up to 180 can be accommodated with a wide variety of options. These include group business dinners, wedding rehearsals, weddings, birthday and christmas parties. Great Venue For Private Parties and Wedding Events! The musicians appearing at the Palm Court are some of the legends of New Orleans music. We have live music five nights a week - dinner 7pm til 11pm. The Palm Court is closed on Mondays and Tuesdays but is available for private party bookings on those days We take group bookings up to 180 persons any day or night of the week. A variety of options are open to such groups and we are very happy to work with our clients to provide their group with a customized evening of entertainment and catering according to their needs. Meet me at the Palm Court!